Dr. William Weinrich, professor of Early Church History and Patristic Studies at Concordia Theological Seminary, Fort Wayne, IN, is the author of the newly released Concordia Commentary on John 1:1–7:1. Shortly before his commentary was published, we interviewed Dr. Weinrich to find out a little more about himself, his ministry, and his work in writing the commentary. Recently, however, we learned the sad news of the unexpected death of his wife, Barbara. We mourn with him, but also rejoice that “whoever hears [Christ’s] word and believes Him who sent [Him] has eternal life. He does not come into judgment, but has passed from death to life” (John 5:24 ESV). While I was yet studying in Basel, I received a call from Concordia Theological Seminary, Springfield, Illinois, to teach in the Department of Historical Theology. I assumed that position in December 1975 and have served on the faculty of CTS since that time (now completing my 40th year!). During my tenure at CTS I have served as Director of Graduate Studies and Academic Dean. I have had the honor to serve the LCMS as well. 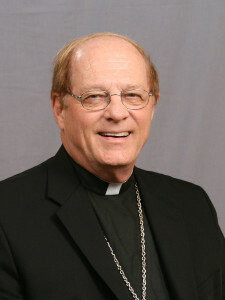 I served on the CTCR for nine years (1992–2001), as Third Vice-President of Synod (1998–2001), and as Fifth Vice-President of Synod (2001–2004). At the invitation of the Lutheran Church of Latvia, I served as Rector of the Luther Academy, Riga, from 2007–2010. I also served as chaplain in the Indiana Air National Guard from 1977–2004, retiring at the rank of Lieutenant Colonel. I have been married to Barbara for 45 years, and we have three children: Rebecca Bekkenutte (Manchester, England); Rachel Baker (Indianapolis, IN); and John (Fort Wayne, IN). I first attended the University of Oklahoma with the intention of becoming a heart surgeon. With that in mind, I took various science classes and minored in chemistry. Toward the end of my sophomore year, however, I determined to enter the ministry, eventually majoring in history and philosophy, with classes also in Greek and Hebrew. Important was the influence of my campus pastor, William Hecht, who was himself an intellectual pastor. He introduced me to Dr. Robert Preus, who was at that time a professor at Concordia Seminary, St. Louis. It was a difficult time to be at a university and to be a Christian. The Vietnam War was in full swing and traditional ideas and institutions, including the church, were under attack. I came to the conviction that the Christian faith required persons who were interested and able in theological study. Actually my first area of academic interest was/is Patristic Studies (Early Church History). Already during my seminary training in St. Louis, I had read Ignatius of Antioch and become aware of his relationship to the Gospel of John. While writing my dissertation in Basel, Switzerland, I again read Ignatius but also the Gospel of John, this time from the perspective of confession and martyrdom. So one might say that Ignatius of Antioch was the immediate conduit for my engaging the Gospel of John, although the Gospel itself proved to possess the power to entice and to entrance me into an ever-deeper engagement with its text. Over the course of a long tenure of teaching, I have become ever more conscious of the theological depth of the Gospel and the wholistic theological vision John’s Gospel presents. My familiarity with the early church fathers, who were profoundly influenced by this Gospel, also led in this direction. While a student in St. Louis, Professor Martin Scharlemann taught me to respect the NT text as a text that preaches. In Basel, Oscar Cullmann urged the view that NT studies, when best pursued, are intimately related to the study of the Early Church. Writing the commentary on John allowed me to reflect upon these convictions and, at least to some extent, to instantiate them through my commentary on John. Of course, while writing, one rather frequently is surprised by new, sometimes unexpected, vistas and perspectives. That is a mental treat, as well as a prod to a better commentary. There really was no “worst” part. There were frustrations. At times, other obligations assumed priority over writing, which prolonged the process. Serving as Academic Dean for Concordia Theological Seminary and for four years as Rector of the Luther Academy in Riga, Latvia, were wonderful opportunities to contribute to those schools and the students there, and I would not trade those experiences for anything! At the same time, they were obligations that demanded time and energy. Other frustrations included the annual inundation of newly published scholarly materials concerning John’s Gospel. Can one possibly take all of them into account? Answer: No. Frankly, I would be rather skeptical of myself and my commentary if we claimed to make a really “unique” contribution. Of course, there may be certain features that are rather uncommon. If by “unique” one speaks of meaning or of theological content, then I would hope that I have made no “unique” contribution. In my writing I have tried to engage and to reflect a conversation with important and representative commentators of the past and present. This does not mean that I merely ape them or report what they said and thought. Yet, their ideas, insights, and perspectives were instruments and assistants of my own thinking. To regard the interpretative task as an enterprise between the text and the commentator alone will almost certainly result in private notions and personal speculation. The biblical text is an ecclesial text. Were the interpreter to remove himself/herself from the church’s confession (not that of the academy) and use of the text, then the text itself will become de-contextualized and a stranger to itself. That being said, I have attempted to reveal the interface between Christological proclamation and Ecclesial reality throughout the Gospel of John. That interface occurs by way of the sacramental character of that proclamation and of that reality. The life of the church lies within the story of Jesus, and so the story of Jesus bears intrinsically the story of the church’s life. In the Gospel of John, this perichoretic relationship of Christology, Sacrament, and Church lies within the fundamental fact of Jesus’ crucifixion, which reveals and presents the God of love and so reveals and presents the life of each disciple of Jesus: “I give you a new commandment, that you love one another as I have loved you” (Jn 13:34). On three occasions the crucifixion of Jesus is said to be his exaltation (Jn 3:14; 8:28; 12:32). Thus, the ascension/Lordship of Jesus lies within the cross, not outside of it or in addition to it. This means, in addition, that the realities and functions expressive of Jesus’ Lordship lie already within the cross and not outside of it. Result: The cross of Jesus (that is, the Crucified Word) is the form and content of the knowledge of God, of our salvation, of the life that the disciples of Jesus receive and are to live. The Feast of Tabernacles governs much of the theological themes of John’s Gospel. Specifically, John chapters 7–10 are narratives directly associated with this Festival. In sum: The crucified Jesus is the center to which all are gathered, and the crucified Jesus is the source from which the redeeming/cleansing waters flow. He is the new Temple, the new sacrifice, the form of the new worship, the place of God’s dwelling. I would hope that my commentary might prove to be an incentive for our pastors to read the Gospel narratives as deeply theological texts that continue to speak to us because they speak of those “holy things” that are ours: Baptism, the Eucharist, the church, the ministry, the missiological imperative, and the diaconal imperative. In short, the Gospels lay bare that reality of faith, hope, and love that we already have and in which we live and of which we are to be. Here we must be humble! I will have no legacy other than the many students I have had the honor to teach throughout the years and whom, in some manner, I have influenced. The readers of this commentary will also be numbered among them. May that legacy be to the good of the Church of Christ!